Hire a Garfield Jazz Combo! Entertain friends, family, or co-workers with live music by a Garfield Jazz Combo! A combo from the nationally renowned Garfield High School Jazz Ensemble provides artistic excellence and exceptional value perfect for parties, receptions, and other functions. 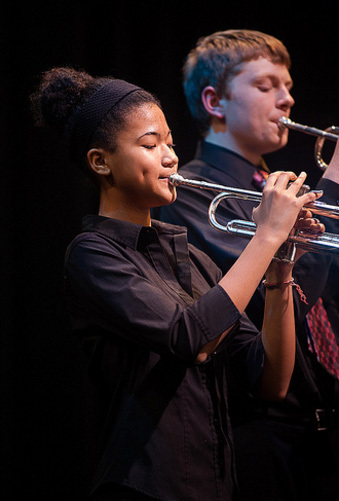 All combos consist of current players from the Garfield Jazz Ensemble, which has been a consistent winner at major regional and national high school jazz competitions for many years. When you are ready just download the Combo Request Form to get started! NOTE: this form is a Word doc, please fill it out as completely as possible in Word, save and email to combos@garfieldjazz.org. Jazz groups come in all assortments and sizes, depending on the occasion and the event site. Garfield Jazz Combos can be arranged from trios up to sextets. A combo typically consists of a rhythm section (for example: bass, drums, guitar, and/or piano) together with instrumental soloist(s) such as saxophone, trumpet, or trombone. The specific combo that you hire will be subject to availability and budget. The musicians arrive a half-hour before the start time and play for up to 2 hours, with a 10-minute break between sets. Slightly longer times can be negotiated. The gig should consist of a clearly-defined length of time. Please keep in mind that we cannot ask musicians to stay for breaks of longer durations during the event. Dress for the combo members can be all-black, formal tuxedos; or casual khakis with a nice shirt. We will make every effort to form a combo for your event. Typically, we need to be notified of your event at least one month in advance in order to work out the musician schedules. We cannot schedule any gigs during the school day or during school holidays. All gigs must be in the Seattle area, unless special arrangements are made. There is a minimum fee of $350 for a trio and $75 for each additional instrument. A trio requires about an 8’x8′ space. Larger combos require a 10’x10′ space minimum. Specific information about the venue is helpful for planning and selecting instruments such as: overall room or space description, as well as the stage or area in which the combo will be located. Musicians will supply their own extension chords and power strips for their amps. They will need access to a power outlet. Musicians bring their own instruments, amps, and music stands. If you would like the combo to make any announcements, a microphone will need to be provided. Seating for rhythm players should be provided on-site. Please let us know if there will be a piano on-site, or if there will be room for an electronic keyboard (which can be provided by the pianist if necessary). The same requirements for space and power apply. A tent or covered area is needed to protect musicians and their instruments from sunlight and weather. Nighttime performances will require lighting for musicians to read their music. A hard surface should be put down over grassy areas for flooring under the combo. It is helpful for musicians to know where they can temporarily park their cars to unload their equipment. Other useful specifics include: what door to enter through, ramps, elevators to use, as well as instructions of how to reach the performance site. Nearby parking and possible fees is also useful information to know in advance. The musicians will need a name and cell phone number for a contact who will be on-site when the band arrives to set-up. The musicians will arrive at your event independently. Our heavy performance schedule does not allow our band director to attend gigs. However, a gig coordinator will be available via cell phone the day of the event to answer any last-minute questions. An electronic Letter of Agreement will be provided to you by the gig coordinator along with instructions on where to mail your fee.